With the news that Consumer Direct reported a concerning 40% increase in the number of complaints they have received related to the purchase of pets, largely dogs between 2006 and 2008, and 5,000 complaints in 2008 we are not surprised. Live puppies and dogs whether bought from a person or trading establishment are covered by the Sale of Goods Act 1979. The reason? The advent of the internet in the late 1990’s, prior to this breeders advertised their IG puppies in certain publications and these breeders were generally known and discouraged by responsible IG breeders. Sadly for the poor IGs it is now so easy for these breeders to sit in the comfort of their own home and advertise puppies or stud dogs on the internet, whilst some of the poor dogs being used to breed from are being kept outside, or confined to wire cages with no life other than producing puppies. The Internet provides a false front, a flowery advert, directly aimed at making the IG into a ‘must have breed’ – miniature whippets, as delicate to look at as a piece of porcelain, if that is what you want, have the porcelain on your mantelpiece, all you will need to do is dust it occasionally, without the true commitment of a life with an IG. On average 18 new adverts per week appear on the internet, common sites such as Epupz, Preloved, Classified Ads and many others, featuring pictures of barely dry puppies or only a few weeks old, being held up legs a straddle, fearful tiny eyes. Really loved puppies look happy and relaxed, but not these poor little mites and there are so many of them. It doesn’t stop at puppies, adults who don’t have a useful purpose are advertised too, without breeding restrictions, inciting other unscrupulous people to buy an IG and use them for their own gain, with no thought as to their welfare. Even sick dogs with a fractured limb have been sold, better to reduce the price and let someone else have the problem and the vets bills, and even worse with inherited life threatening diseases, where an obviously ill puppy was advertised on the internet three times over and eventually the last advertiser said she was depressed, realising that this was the third time this 9 month old puppy was up for sale, we were able to do something about it and save her life, but we can’t save them all. Of course the real reason for all the IG’s being bred is nothing other than money, puppies are being sold regularly for anything up to £2,000, money does not ensure a permanent loving home for the IG. 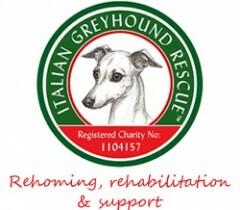 The Italian Greyhound Rescue Charity reject as unsuitable many homes at the initial enquiry stage and a number each year fail the essential home check for suitability for an IG. Before much longer our delightful breed is going to become the must have accessory which past breeders and owners have always fought so hard to ensure this doesn’t happen with all the awful consequences that ensue. We would like to see an amendment to the animal Welfare act to ban the advertising of dogs on the internet; you too can help by spreading the word to never consider buying an Italian Greyhound advertised on the internet and by informing admirers of an Italian Greyhound’s true needs and what they are like to live with. Of course for the breed to survive we will always need dedicated breeders who really care about the offspring they produce and always keep in touch with their new owners to give any help and advice, not people who breed teens of puppies, how can anyone possibly keep track of 90+ puppies and be able to help if there is a problem if their only concern is producing yet more for money? ← Our Used Stamp Appeal has raised £750 but we still need more stamps!